In this article, I will be sharing with you exactly how to start a lemonade stand business. One that can make you $30,000 and even much more. We have vendors currently in our Vendors United group who make well over $100,000.00 annually with their lemonade stand. Many Vendors are having amazing, real monetary results from applying what I teach here and in my free and advanced courses. How much to charge for a lemonade stand? How to run a good lemonade stand? Is it legal to have a lemonade stand? How to sell lemonade at a lemonade stand? Do I need a vendor’s permit to sell lemonade? … or anything else regarding how to start a lemonade stand and run it successfully, then you came to the right place. Can I Have A Lemonade Stand Without A Permit? What Is The Best Price To Sell Lemonade? WHERE CAN YOU OPEN A LEMONADE STAND? 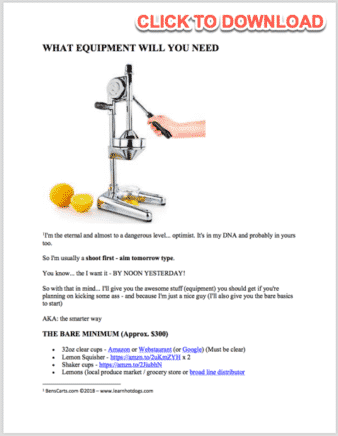 Lemonade Press – Which One? WHERE CAN I GET A COMMISSARY? Can You Have A Lemonade Stand Year Round? Why Not Take A 7 Month Vacation? With this information you’ll be fail-proof and YOU WILL be successful if you apply these steps. A lemonade stand can pay for itself and have cash money profit from day one. Imagine starting with $300 to $500 and making double that back on your very first day. Just this year I’ve watched, helped and talked with over 340 vendors who wanted to know how to start a lemonade stand. 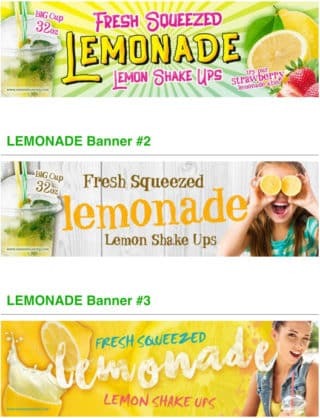 The lemonade vending business is hugely profitable and downright fail-proof. As in – you need no luck or magic beans to make it successful. This is something you need to know before even thinking on how to start a lemonade stand. The short answer is YES, it is legal to have a lemonade stand. That’s the short answer but there is usually going to be some hoops you must jump through first. Some states are very lenient on small businesses like lemonade vending and others are more strict. 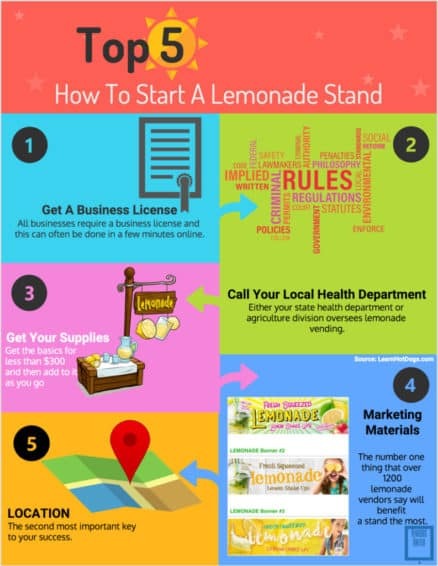 There is always a legal way, but depending on your states health codes – will determine how you can have a lemonade stand. I’ll have more on how to find out what is required in your state down below. Read more about if is it legal to have a lemonade stand in this ARTICLE. 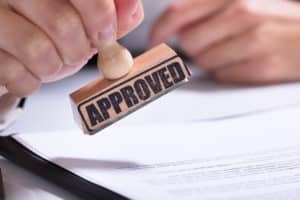 A business license, the easy one to get – simply call your city/town offices and ask about a business license. A health department permit. Can be harder to obtain and will likely have some requirements you must meet first. All in all – both can be done relatively quickly so that you can be up and operational in a day or two. Simply Google: “your county” health department and get the phone number. Ask to speak to someone who handles restaurant inspections. They are known as the “Health Inspector”. Ask this person what is required to serve fresh lemonade at private events or catering events. If you plan on operating on the street or roadside, you can ask this person also about street vending lemonade. They will give you the requirements. Yes, in some states you are not required to have a license. 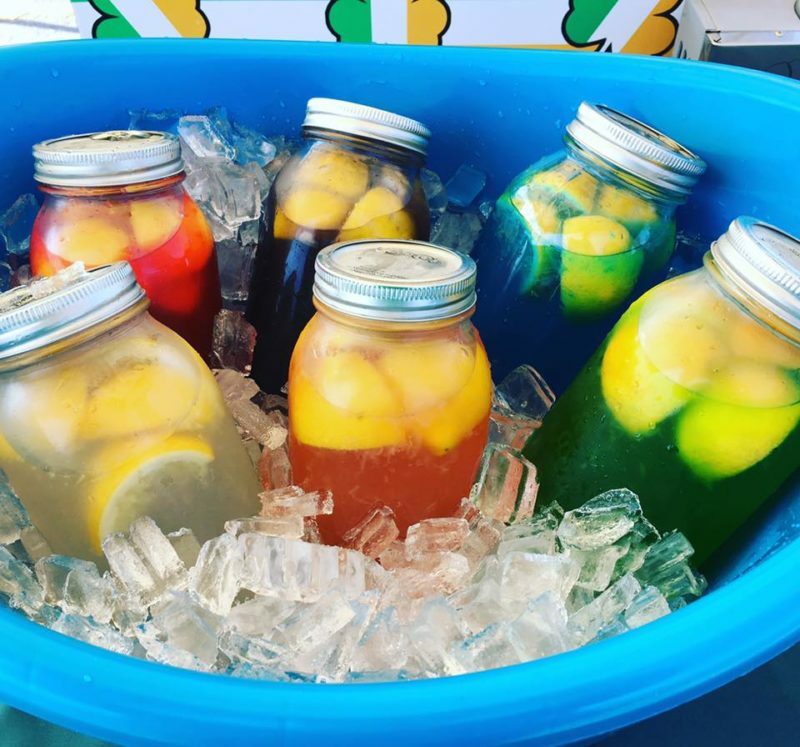 These rules change from time to time but often, lemonade falls under the category of agriculture and like a produce stand, lemonade is grouped in with them. See instructions above for finding out. 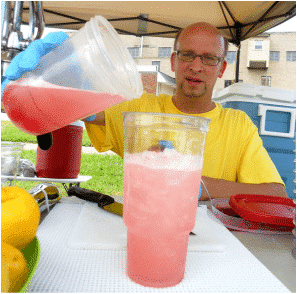 You can get more details regarding if you need a vendor’s permit to sell lemonade in this ARTICLE. Some states may require you have a hand wash sink nearby. Vendors have made their own on the cheap by using a DIY sink kit. They’re pretty easy to make and you’ll find a video that comes with the kits here. That will do the trick. The tip is – your display, your on-site marketing (signage) and your appearance is what matters! 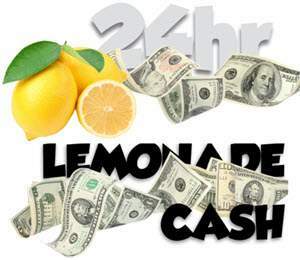 You can read more in detail on how to make a lemonade stand in this ARTICLE. There is no point on learning how to start a lemonade stand if then you don’t know how to properly run one. One of my dear friends and fellow member in Vendors United still has a very simple setup after years of vending. He’s a local legend in his parts and makes a great income from the lemonade stand. It’s all because of his display, signage and appearance. Side by side with food trucks, he will win in volume every time. Here’s a video I did with Ken – check out the cool tips and advice he gives. For more help on how to run a good lemonade stand, read this ARTICLE. Another critical point on how to start a lemonade stand and then run it to profits! The best price to sell lemonade depends on what you’re doing. Are you doing what the pros do or are you just trying to wing it? $6.00 is average. But pay attention… she doesn’t use those cheap pre-mixes. 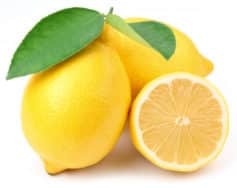 Use fresh squeezed lemons – right before their eyes and you’ll command a price from $5.00 to $7.00. Most of our Vendors United vendors are averaging $6.00 without the addition of fruit. e.g. strawberries, blueberries Then they get another dollar. Essentially anywhere you have people with mouths. Of course some locations can be tricky to get but with some of my super secrets – you could be vending in front of Walmart and the Courthouse and about anywhere else you want. 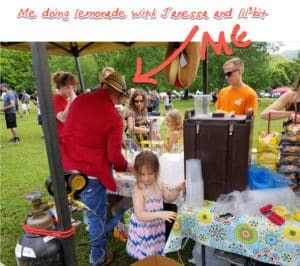 I love doing lemonade vending and recently got to go work with Janessa at an event. We rocked it. Ran out of ice. Got more ice – and ran out again. If you watch the interview with Ken above, you’ll pick up tons of tips and tricks and see the entire process. *note how he has everything within reach of one spot. In the setup here, we’re using a powered press. Powered presses are great but they have some drawbacks. They are expensive, require tanks or compressor and don’t have that authentic feel. However, the sound they make is an attention getter for customers. We’ve tested the speed and it’s about a draw and the pros, most can do the hand press faster. Accept credit/debit cards with the Square. Cost just 3% of each sale but totally worth it. 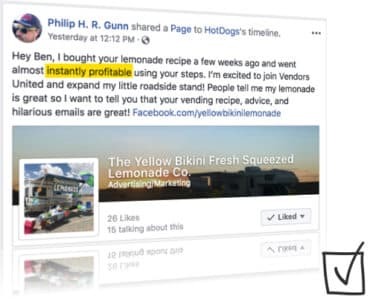 This lemonade stand recipe is by far the best and has won hands down among the others tried by the vendors inside our private Vendors United group. The basics. One lemon + ice + simple syrup + h20 = Cash in your pocket! TIP: Pre mix simple syrup at home… errrr… the commissary. HOW: Bring water to a boil – add sugar and stir carefully until clear and dissolved. Let cool and store. A commissary is a fancy french word for “commercial kitchen”. Some states will require you have access to a commercial kitchen to do your clean up or any prep work that you may need to do. The health inspector will let you know if this is required in your state. *if you’re not street vending and only doing private gigs under the “catering” label, you probably won’t be required to have one either way. Yes. It really helps if you live in a southern state, but absolutely. There are some challenges for this though. Lemons are harder to get and more expensive in the winter months. 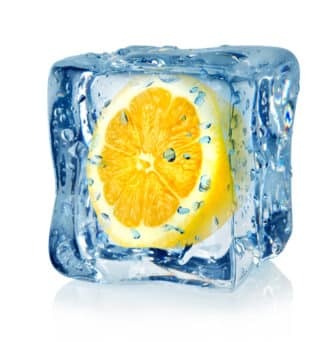 Additionally, most folks aren’t prone to having something ice cold when it’s cold outside. We have vendors in Canada, Alaska and all those super cold areas of our country. Most don’t work year round. Instead, they make all their money during the warmer months. One couple, work a stand on a lake. Because they have about 4 months of good weather and make over $40,000 during that time. We have vendors in our Vendors United group who do small festivals and events and take in $5,000 – $10,000 and more during a weekend. So – it’s definitely doable and you can too. Alternatively, vendors have picked up other vending types for the winter which make a steady income year round while working just part time hours. And We actually have proof! Over 30,000 vendors worth of proof. 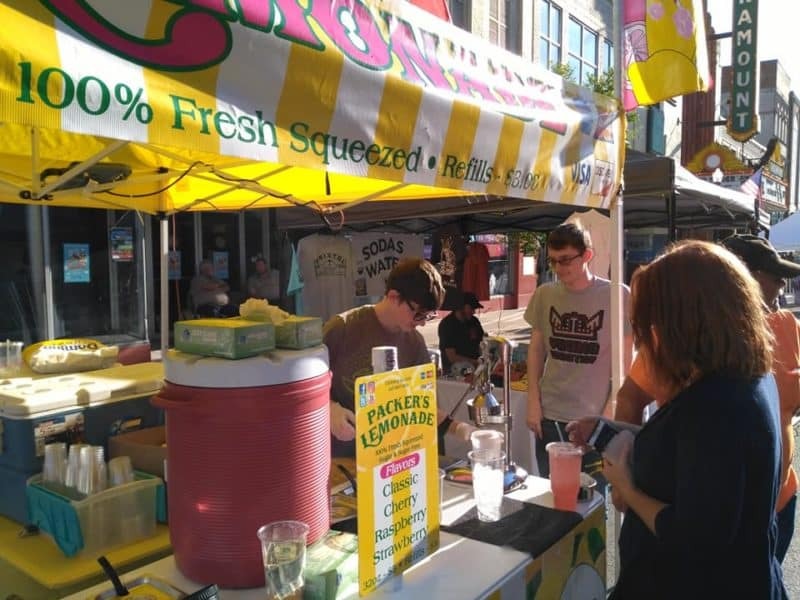 Some vendors use how to start a lemonade stand business to catapult their expansion into catering, street food vending and my favorite… hot dog vending. You can see that in action here. Although a huge cash business, you’d be wise to accept credit cards. With the new systems, such as Stripe and Paypal you can accept payments instantly with your phone. Most of us use Square because it is simple to set up and customers recognize it immediately. 10 years ago, about 85% of all sales on a cart or lemonade stand were cash. Now – it’s about 55%. The rest is… credit cards and debit cards. Make sure you don’t miss that big opportunity. *Some links within this site may be affiliate links. This means that if you choose to purchase something from a link, we may receive a few pennies or some small percentage of your purchase. This in no way affects the price you pay. I just wanted to say how much I love your videos, and your book, “Hot Dogs Saved My Life”. I was one of those people that felt like when they were a little kid, they could not answer the question what do you want to do when you grow up. I love people, and I love to make people smile and laugh. My dad was his own business owner, and I knew I had that drive to be an entrepreneur, just like he was. I know I can do this. Money is the issue with getting started. I want to start my own Hot Dog cart, but I received this email tonight about a Lemonade Stand. I couldn’t believe really how cheap you can get started for. I live in NC, so I do not need a permit. I have been researching all night on supplies and watching your videos. I am totally hooked. You gave me that inspiration that I needed to start feeling whole. The feeling of knowing what I really and truly want to do. I have contacted a local flea market and guess what. She is thrilled and excited to have me come out, as there is NOT a Lemonade vendor there. So she feels it will be a great addition. So needless to say, I am feeling very excited and a whole lot closer to being able to hopefully purchase that shiny Big Dog Cart, hopefully not too far in my future. Thank You Ben, you are the best and a blessing to people like me, who know deep down they have more to offer this world than to work ourselves to the ground, with very little appreciation, when we can have our own business and put in the work, and just be so happy with the turn around we receive. You’re so much welcome! Believe in yourself and do not let anything or anyone stop you. I’m not sure. I don’t remember now.